The S/7000e combines one of Threshold's most well-regarded traditional values--prodigious power at an affordable price--with the features required for Home Theater. The S/7000e is the heir to Threshold’s legacy of high-current designs that effortlessly command and control demanding loudspeaker loads. But power is only part of the story. As one would expect from its audiophile pedigree, the S/7000e employs minimal feedback and is direct coupled input to output. The result is superb resolution of both musical scores and cinematic sonic effects. 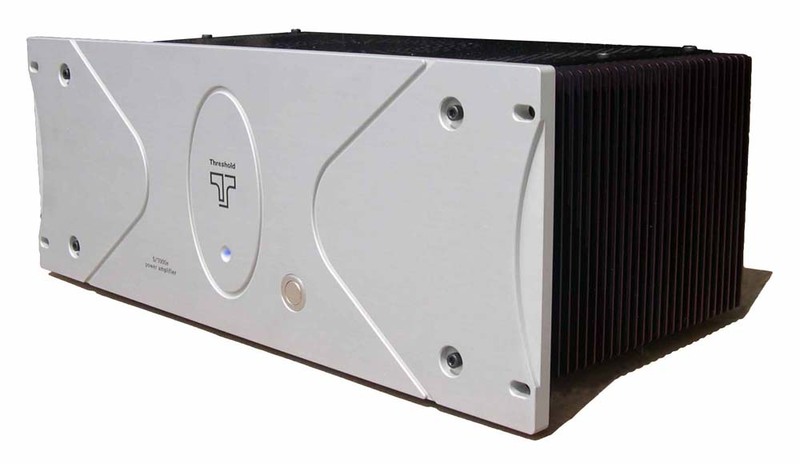 The ability of the S/7000e to explicate complex soundscapes confirms its heritage--flowing not only from the famous Threshold designs of the past, but from today’s remarkable flagship power amplifier, the STASIS 8.0. Although ideally a single S/7000e will be used for each channel, the most typical 5.1 combination uses three S/7000e amplifiers for Left, Center, & Right with one two-channel S/5000e covering the rear channels. Both amps are equipped with 12Volt triggers so that they may be controlled from the processor. This "intelligent" trigger system also allows them, when used in a multi-channel setup, to turn on and off in stepped sequence. The S/7000e now makes Threshold the highly affordable state-of-the-art choice for both music and cinema.